The peace of the Lord to you! Today, God has given me a word of encouragement for you or someone that you know. In the journey of life, there are many uncertainties. We wonder if we will be received well in the places we are going, we wonder if our expectations will be met, we worry that trouble may meet us at some point and get the better of us. But God brings us a word of comfort and assurance on this today. I don’t know about you but this promise is what I’d call a game changer. The devil may think he’s having an upper hand in your situation, but now, here comes the word, God Himself, for God is His word! I’d say things are about to turn in your favour! I’d balk at going anywhere alone no matter how fantastic it is touted to be. But I’d be willing to go even where things might not be rosy if I knew that God would be going with me. And see how powerful the promise is: levelling the rough places and shattering formidable barricades! It doesn’t matter how high the barricades are either. The rendering of the same verse in another translation shows God’s got you covered! The surprising thing is that God originally made this promise to Cyrus, a pagan king He wanted to use to free His people, Israel, from captivity in Babylon and to rebuild the temple in Jerusalem. Now if God was willing to throw His weight behind an idol worshipper (Isaiah 45:1-4) and equip him to do His will, how much more will He do for you, His child redeemed by the precious blood of His Son, Jesus! The Lord made a similar promise to the children of Israel when they were in the wilderness. Travelling through the desert is a daunting experience even in this modern age. You can imagine how much more dreadful it would have been thousands of years ago. But God had accompanied them in the pillar of cloud by day and the pillar of fire by night (Exodus 13:21). However, the most critical part of their journey was still ahead of them: entering and possessing the land of Canaan. To do that, they had to conquer and destroy seven nations of heavily armed giants with fortified cities and renowned battle skills. Naturally, the Israelites were quaking in their boots. Enter the word through the servant of God, Moses! There it is! Right in the middle! The expression that packs so much strength into a failing heart, the expression that feels like cold water to my weary soul whenever I come across it: My heavenly Father will never leave me nor forsake me. Hmmm! This calls for a deep inhalation, an inhalation of peace, of power and boldness! Before the time God gave this word to the Israelites shortly before Moses handed over office to Joshua, He had in a similar vein told Moses to tell the Israelites He would lead them out of slavery in Egypt and take them to possess the land of Canaan. Unfortunately, this word didn’t do much good to the Israelites to whom it was spoken when it mattered most. That was when they were on the verge of entering Canaan for the first time after leaving Egypt. They held on to their fear and told God they’d rather take their chances with the Egyptians than confront the Canaanites. They chose to return to servitude in a foreign land rather than becoming masters in their own land: a land flowing with milk and honey. But God told them that option wasn’t on the table. Result? Those who trusted God defeated the Canaanites eventually and inherited the promised land. And they were a grand total of two old-timers, namely, Joshua and Caleb, along with a whole new generation born during their forty-year wanderings through the desert (the punishment God imposed for their disobedience). The rest got what they told God they preferred: dying in the desert instead of fighting the dreaded Canaanites. That will not be our portion in Jesus’ name. We will trust the Lord. We will confess what He says, no matter how contrary the circumstances around us may be. And we will see Him smoothen the crooked and rough places. 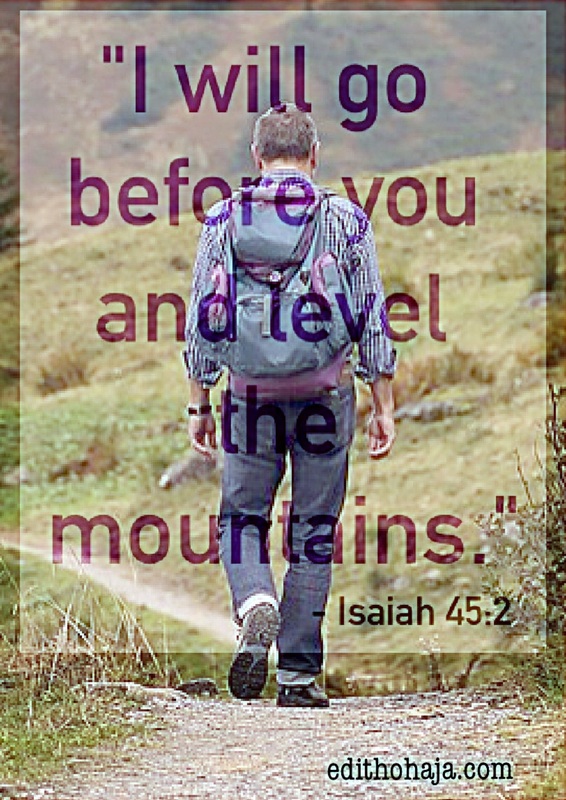 We will see Him clear gigantic obstacles and we will enter into His rest to the praise of His glory in Jesus’ name. Amen. Yes ma'am. Your post has reminded me that even in the fiery furnace He'll be the fourth man there, because He'll never leave me nor forsake me. Glory to His name. You are richly blessed in Jesus' name, my dear! Amen. May God bless you more, Amarachi! You are a gift to this generation. Awww, what a lovely thing to say! All glory to God and many blessings to you in Jesus' name. We need this reminder often. My Bible reading was in Deuteronomy today, and already God has told Joshua three times to be strong and courageous. I'm so thankful for life's reminders! Thank you. Thank you very much, Traci! Our God is faithful. Thank you for this piece. I pray that God's grace will be there to enable us to confess positively at all times. Thank you Jesus for being there for us even when we do not deserve your care. Nice one ma, it is pleasant to read such reasurring words from you, which is according to the word of God. Keep it up ma! Thank you ma for this wonderful post..you reminded us again that our God is a faithful God and wil never forsake us...God bless you. Yes, He is, always faithful, always near. You are blessed! Beautifully written and comforting too.. thanks for, it was profound! Glory to God! Abundant blessings on you and yours, my favourite sister, Rita, in Jesus' name. Amen. I thank God you were blessed by it. Thanks a whole lot, April! Love you loads, dear sis! I pray grace multiplied upon every area of your life in Jesus' name. ??? Amen and Amen. Remain blessed, Chidi! Thanks for this wonderful article. Pray for God's grace to always listen to his instructions. Amen. Saves us a lot of trouble. Bless you, Nkemjika. Yay, thanks for visiting Christine! The Lord is your strength. I can't imagine what that feels like but I believe it's better with faith in God than without. I was telling a friend once that I just don't know how unbelievers manage 'cause I can't go a day without God. God's grace, my sister. You and yours are super blessed in Jesus' name. Glory to God! You're blessed, Susan! Comfort, comfort, my people says your God (Isaiah 40:1) even when we are unworthy, He always comforts us. He is faithful even to the unfaithful, His Mercy endureth for ever. Indeed He goes before us. Bless you, Victor! He is altogether lovely and worthy to be praised! Yes, God promised that he will never fail us because His faithfulness edureth forever. I think we should learn to hold unto God through thick and thin, call Him before embarking on any journey and he shall do what He promised (leveling the ground before us to make everything easy). It's really a nice article Ma. It's more than being with us when we travel. It's a metaphor for God's guidance in every area of our lives. Bless you, my dear! Thank you, Osmond, and remain blessed! where you get your inspiration amazes me...nice write up Ma.. Glory to God. He is the supplier of the inspiration. You're highly blessed, Chiamaka! The Lord is faithful in taking care of His own. All glory to Him. May the answer to your prayers come in full in Jesus' name. His love is still the ultimate. Even when life seems hard and full of uncertainties, he is there. May your love never depart from my life oh! Lord. Please don't forsake me even though am not worthy of your love. Always be sufficient for me....Amen. Beautiful prayer. Amen in Jesus' name. Yes o, His infallible WORD has said it all, that "he will never leave me nor forsake me." And truly God is more than faithful to keep His promises towards His own. His word has has given this assurance that "He honoureth His words above His name, therefore faithful is He that has promised." Thank you ma, for reminding me of these words of His; that "He will always go before me to make every crooked way" in my life and pathways straight. It's really a great reminder, well done ma! God is Good. Im grateful that he is using you to touch lives like the way you've touched mine. There is no need to fear because our God is there. Nice one ma. May God bless you and continue to use you to bless and encourage us with your mind blowing posts. Your words are really encouraging and its a reminder that in the mist of challenges, God's love and guidance is always constant. thank you so so much ma. Thank you ma for sharing this, it's soul uplifting. Just enough word for the beginning of the semester! But to think that often when the going gets tough, I hardly ever remember these things. God will help me... Thank you ma for this. May God give us the grace to keep trusting Him and believing Him no matter how tough or rough. God is always working out something good for us. Also I am now more assured that God's got me covered. God bless you, ma! When u're in doubt, remember God's promises. Inspiring write up. God bless u ma as u bless others with his words. This is one promise that keeps me going. The promise of God going before us and making the crooked places straight is everything. God's abiding presence is our assured hope of victory. Halleluyah! When the Israelites came to the red sea, because God is leading them and clearing the path for them, He made a path down to the bottom of the sea and the israelites crossed over with no fear. As far as God is before me, I have no reason to get discouraged or fear what fate holds for me any time any moment. Glory to God! You are blessed, Itoro! my soul is lifted, God bless you Ma. Once again, Aunty Edith is doing what she knows how to do best- inspiring us with God's faithful promises. thank you very much maam for the piece. am toiched. may God keep inspiring you. amen. I'm really short of words. Our God is indisputable, indestructible, amazing and awesome. Thanks to our Lord Jesus. This post is inspiring and motivating as well. Oh my! this write up is very nice. God is a Wonder worker. he is the only one that can make the impossible possible. he makes us understand that he is always with us no matter the issue ..I pray he gives me the heart and courage to adore him always. This post is a well garnished food and has, at the same, time radiated the ray of hope in the tunnel of uncertainties of life. God is an unforeseen lover, who will never abandon us. His promises are enduring and not ephemeral. Since he can throw his weight behind an idol worshiper, how much more his children who he purchased with the precious blood of His lamb to fulfill his salvific promise. This post is motivating and captivating too as God said he would always go before us so that no harm will come to us, just as he went ahead of the children of Israel when they were about to cross the red sea. this post reminds me of the Lord's goodness and graciousness. bless you ma. Ma, this post is motivating, it has a way of getting one back to his feet knowing that some body great has got his back. When I remember the place where u picked me from, I thank God for where I am today, I see him doing a new thing in my life oh lord I thank you for the future I see, because u will always go before me. Thank you Jesus for you have always been my shield and i have found out that when i try to do it myself by going out of your presence; i fail. He will go before me and i belief Him. Thank you ma, for writing such a great article on this kind of topic. I am lifted and blessed reading this piece. I am grateful ma, for using this medium to motivate and encourage me in my trust in God. God says he will be with us and not forsake us,all we need to do is to give him that chance in our lives thereby committing him first in everything we do, we should allow him direct our paths.the Lord have never forsaken his people in the past ,so he will never forsake us now because he never changes , his word remaineth the same forever. God promised us that he will be with us and not forsake us,what is required of us is to give him that space to come into our lives and take control of everything, we should commite him first in all we do.he never forsake his people, he is ever compassionate God. I pray that the Almighty God will go before us and make our crooked paths straight and level every difficult mountains in our lives in Jesus name. Amen. God bless you aunty Edith. You are a gift to this generation I think we should learn to hold unto God through thick and thin, call Him before embarking on any journey..